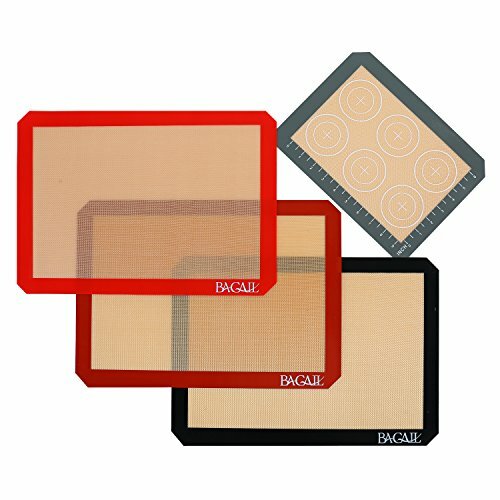 Why choose Bagail Baking mat? Healthy-Eliminate the need for cooking sprays and oils. Mats are composed of FDA and LFGB approved materials and are BPA free. Economical-Replace disposable nonstick options like parchment and wax paper with a durable, long lasting solution. Multi-Purpose- Put our multipurpose mat to work in the oven, microwave, toaster oven, and freezer. - Multi-purpose non-stick silicone baking and pasty. MULTI-PURPOSE&LONG LASTING: Perfect for baking, kneading, rolling, candy/macaron/pastry/cookie/bun/bread making as well as for freezing meat balls, dumplings, fruits and vegetables. It's flexible yet tear resistant, and designed to withstand thousands of uses under extreme conditions of bitter cold and intense heat (from -40°F to up to 480°F). 100% SATISFACTION GUARANTEED: If you are not satisfied with our non stick baking mat, we promised you will get your money back or a new replacement. All our products deserve a 60 DAYS NO-QUESTION-ASK RETURN service. If you have any problem with us, you can feel free to contact Bagail after sale service.